Quick Quiz: How Well Do You Know Your Business? Do you wonder what others are saying about you or your realty firm? Are you perplexed with how to stay in-tuned with the latest gizmos and gadgets for real estate? Are you "in the know" about the latest residential developments in your area or what Fortune 500 companies are setting up shop in your "neck of the woods"? The simplest way to keep up with all of these details and much more is to set up an electronic alert (that can be emailed to you daily or multiple times a day) for each topic that pertains to your real estate sales and the specific topics that you want to keep tabs on. Creating electronic alerts is critical for you to not have to hunt down news stories all across the internet. Plus, you can even cut down your email subscriptions to numerous online news feeds because you can create an alert that will filter typically your favorite news portals and give you only the relevant posts. The "old school" way to do this is to use Google Alerts. Don't get me wrong - I have been a fan of Google Alerts for years now (in a fast-changing techie world, that is saying something!). BUT it may be time for my beloved Google Alerts to take a backseat to a more superior and also FREE alert system. 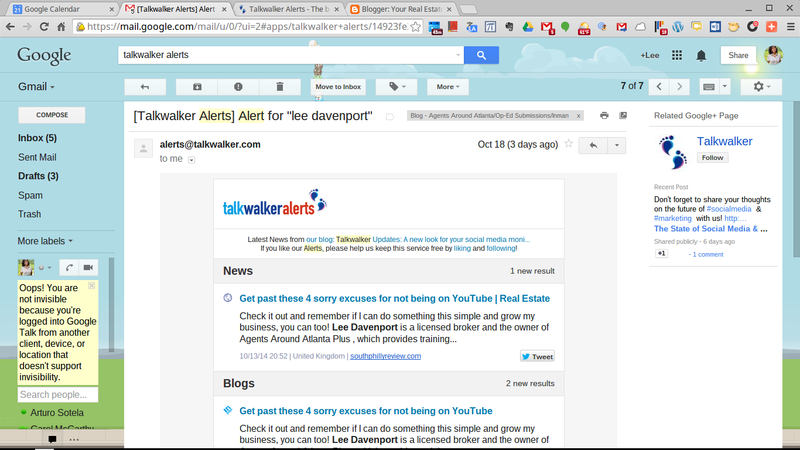 Talkwalker Alerts are like Google Alerts on vitamins! What do I mean? 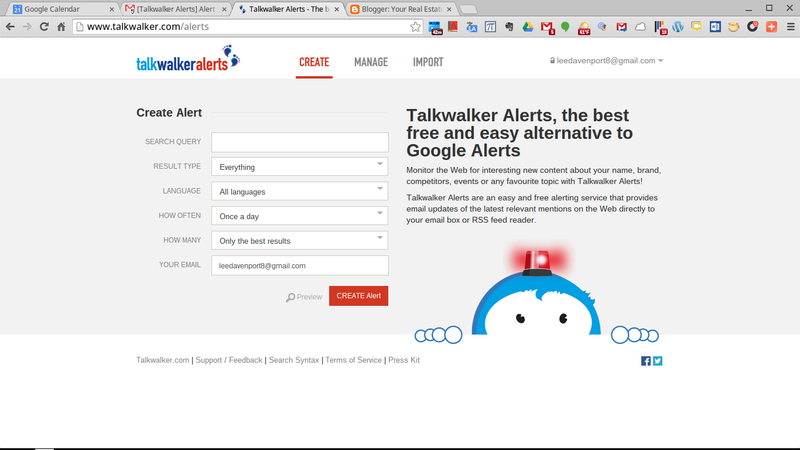 Well, I have been testing out Talkwalker Alerts now for a couple of weeks (I didn't want to give my stamp of approval without vetting it properly of course) and they claim to be "the best free and easy alternative to Google Alerts". Ok sure - tell me anything, is what I initially thought as I entered my typical search alerts in their fields. Boy is their marketing pitch the TRUTH! 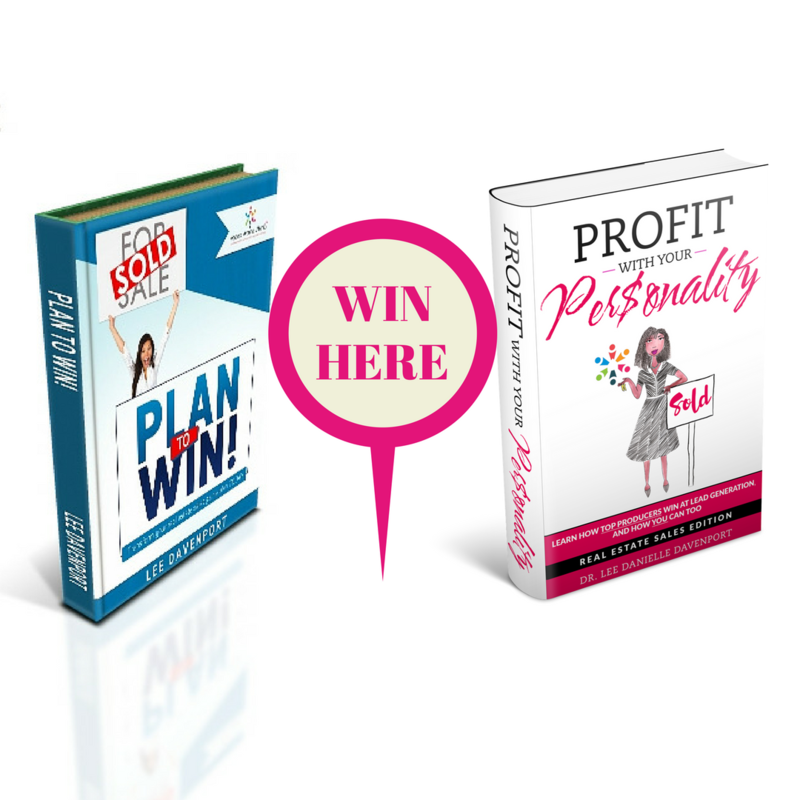 We all know that savvy marketing companies at times employ hyperbole in their pitches in order to get clicks, likes, shares and any other type of visible interest. But Talkwalker Alerts are what they claim to be. For example, a typical Google Alert will show the links to news stories and general web posts that mention your phrase that you have tagged and entered to receive alerts. Sidebar: I have to say it again, receiving alerts about your name, your realty firm, your targeted clients, your targeted location and even new technology are important for you to receive and review so that you stay abreast of all developing news pertinent to your business' growth and longevity. But a Talkwalker Alert is more informative. It shows links to new stories and web posts but goes a few steps further to show interactive blogs with comments and chat-boards/discussion groups. Wow! With Talkwalker Alerts, now you can weigh in on topics where you can flaunt your experience and expertise in real estate, ultimately expanding your reach to elicit new, ready and willing buyers and sellers. I was able to chime in on a discussion being had about one of my posts that I had no clue had been posted on another blog website - yikes! The discussion was positive but nevertheless I would have been clueless had it not been for the Talkwalker Alert on my name. The Google Alert on my name to this day has not shown this blog post. Also, I have been able to give my two cents in various discussions on specific real estate topics that I am passionate about simply because of these timely Talkwalker Alerts. 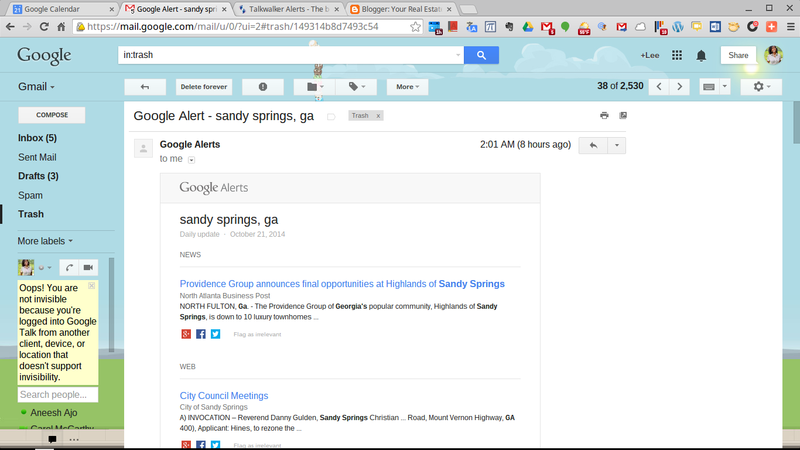 A Google Alert just does not delve into actual discussion groups (at least not yet). Many times with social media marketing it can feel like we are "sitting ducks" waiting for someone to engage us but these alerts let us reach out to those that have questions and concerns about the very real estate terms and steps that we are well-versed in. With Talkwalker Alerts, your alerts go from only giving you information to giving you social platforms to engage in and that's critical to being a Realtor 2.0 (which is a Realtor who knows how to leverage the power of social media and the online marketspace to create and sustain a thriving new millennium business). Be on the look out for our NO FEE whitepaper coming in December on being a Realtor 2.0 that will discuss more of the tools and technology that every agent can and should leverage for business growth. Note: I am not affiliated with Talkwalker in any way I just think they offer a solid 2.0 FREE product that can benefit every agent's business and rivals Google Alerts so I hope this post helps you.